So, you're interested in buying a 1969 or 1970 Ford Mustang BOSS 302 or Mercury Cougar Eliminator? Well, you've come to the right place. We have a few tips on where to find one and what to look for when you think you've found the car of your dreams. Remember, you're buying a used car. Be smart. Buyer beware. First tip, buy this book, if you can. Mustang BOSS 302 Ford's Trans-Am Pony Car by Donald Farr. It is currently OUT OF PRINT. It was available online at places like Amazon.com or from Mustang parts vendors such as National Parts Depot. It occasionally comes up for sale on eBaytm or our messageboard. 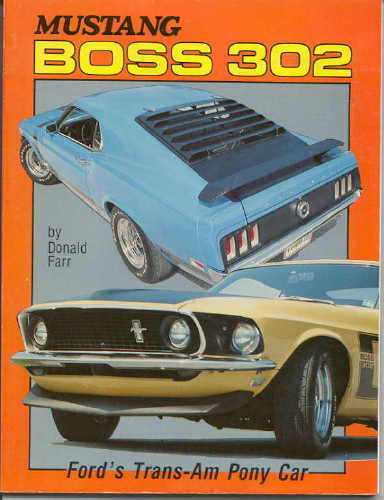 Considered the "bible" on the BOSS 302, it tells the whole story from beginning to end. It's worth the investment and is nothing compared to the thousands of dollars you will spend buying and keeping your BOSS 302 running and looking good. We don't get any money from the author or the publisher for saying that. It's just a fact this book is the best and there's no point in us trying to re-do something that has already been done so well. Second tip, now that you have all that knowledge, where do you look for a BOSS 302? Right here online at the BOSS 302 Registry, on our messageboard, The BOSS 302 Exchange. You'll find plenty of fellow BOSS 302 owners buying and selling cars and parts and exchanging BOSS 302 information. Other online resources include eBaytm and similar auction sites. There are other Mustang/Cougar websites which have areas for posting cars and parts for sale. Check our LINKS page for more online resources. Buyer beware. Look out for online scams. If you see a car for sale at what seems to be a too-good-to-be-true price, it probably is a scam. The most common scams refer to the owner being in a foreign country but the car is in the U.S.A. and is readily available for pick-up. Or the seller is in a foreign country and wants a Western Union payment. Probably the #1 resource in print publications is Hemming's Motor News. You can find just about any car or part you can think of for sale there. Check your local bookstore or magazine rack. Along with Hemming's you should be able to find other muscle car and Mustang/Ford/Mercury magazines with classified ads. Speaking of classified ads, don't forget your local Trading Timestm or car trader magazines and newspapers. Tip number three. When looking for a car, go where the cars go. Check out car shows, swap meets, and cruise nights. Look for your local Mustang/Shelby/Cougar club and attend their meetings. Meet people. Talk to owners and friends. Chances are pretty good they know of cars for sale, even their own car if you ask! Fourth tip. Know what you want before you go shopping. It's one thing to say, "I want a BOSS 302." It's better to say, "I want a yellow 1970 BOSS 302 with deluxe black interior, rear spoiler, louvers, Magnum 500 wheels, shaker hood scoop and power steering. By knowing what you want, you can save yourself a lot time by narrowing your search parameters and disregarding all the cars and advertisements that don't meet your wants. No point in wasting time to go look at a BOSS 302 if it's not the right color or doesn't have the options you want. Fifth tip. Get the "Marti Report" before you look at a car. The Marti Report is an information package offered by Marti Auto Works. 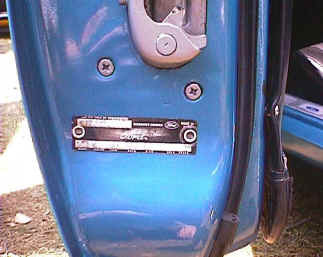 It can tell you everything about any Ford, Lincoln, or Mercury made in North America during 1967-1973. Ok, so let's say you have located a potential purchase car. What do you look for? Look for the vehicle identification number (V.I.N.) 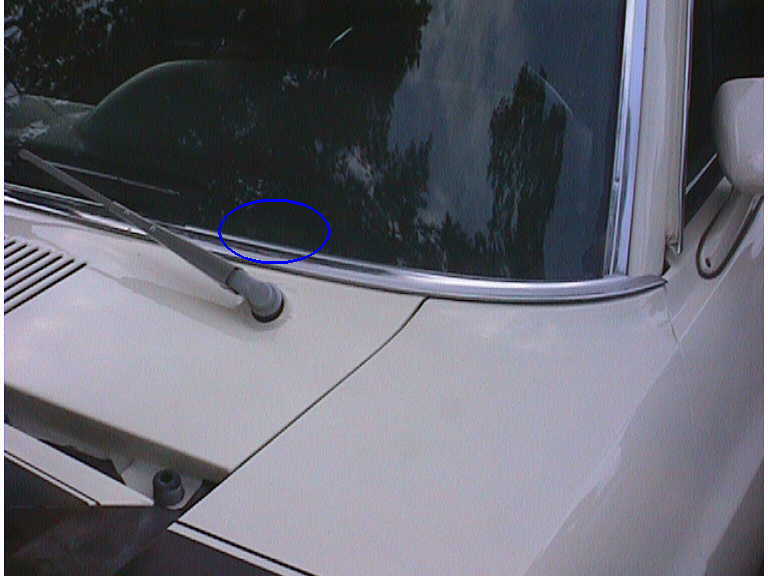 plate at the driver's side base of the windshield as shown circled in blue to the left. Is there a plate? Buyer beware. This is considered the legal plate for vehicle registration. Missing or doesn't look right? Read up on V.I.N.s. The V.I.N. should have the letter "G" in the fifth position. Example: 0F02G123456. "G" is the code letter for the BOSS 302 engine. If there is no "G", then, plain and simple, it's not a BOSS 302 even if the car has the stripes, louvers, spoilers, etc. Open the hood. Is there a BOSS 302 engine there? Look for screw-in freeze plugs in the block, 8 screws holding down the valve covers and the thermostat housing mounted to the intake manifold. Take a peak at some of our engine photos in the Photo Gallery. Look at the photo below. The red circles near the shock towers indicate where the V.I.N. or a partial V.I.N. (Ex: 0F123456) should be stamped into the top of the inner fender panel. The numbers may be hidden by the fender. Check these numbers against the number on the V.I.N. in the windshield. Do the numbers match? They must. On some 1970 Metuchen built ("0T" leading digits in dash V.I.N.) cars we have found "1T", "2T" or even "4T" as the leading digits of the V.I.N. stamped on the fender inner. If this is the case, do not panic. As long as the last six digits, 123456, match the last six digits in the windshield, 123456, you are ok. If they don't, buyer beware. The other circles indicate where the body build tag should be located. The V.I.N. and other option codes are stamped into this metal tag. Not all cars will have these tags this late in life. On Dearborn built ("9F" and "0F" leading digits in V.I.N.) 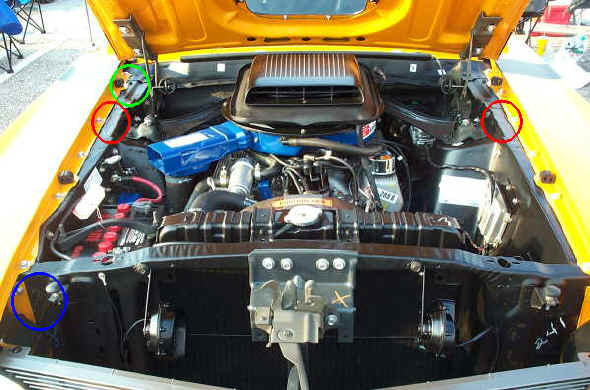 cars it is typically on the radiator support behind the passenger side headlight(s) in front of the battery (blue circle). You can barely see the tag here in this photo. 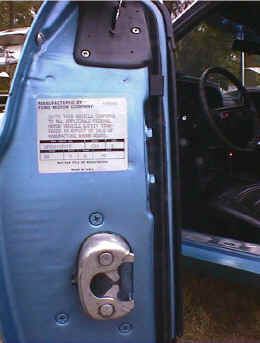 On Metuchen built cars it is possible the tag is located on the passenger side inner fender (green circle). Open the driver's door. On a 1969 door you should see a metal plate riveted near the bottom. On a 1970 door you should see a sticker. This is the door data plate. The V.I.N. and other option codes are stamped or printed on the plate. Not all cars will have these this late in life either. If there is no plate it is likely the door has been replaced or repainted. Check these numbers against the number on the V.I.N. in the windshield and the body buck tag. Buyer beware. Do the numbers/codes match? Does the plate or sticker look brand new? These items are available as new reproductions. Now, a reproduction is not bad in itself. What is bad is people have them reproduced and change the codes (intentionally ... or maybe not) to represent something other than what originally came from the factory. We've done a lot of talking about matching numbers. There are some people out there with questionable motives. See here. That's it for our quick tips on buying a BOSS 302. Good luck and don't forget to register your car with us when you get it.